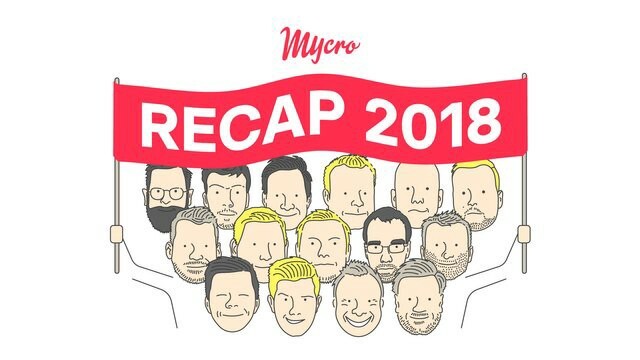 Happy holidays from the Mycro team! We hope you had a merry Christmas and are going to have a sensational new year! Thank you for being a member of our community. We’ve all had a big year, and we’d like to share some of our achievements from 2018 with you. Be prepared for 2019, it’s going to be an even bigger year for us! We gave our first pitch at the Growth Finance meeting hosted by CMS. Our CEO, André, took part in a talk about the practical uses of ICO’s for raising capital. To stay better connected with our community and to maintain a more efficient flow of information, we developed and released our website. Our website has since become our central point for connecting with new members of our community. Anticipating our future success and ensuring that our community had a brand they could trust, we coined the Mycro brand. We released the first version of our whitepaper! We were the proud sponsors of the first Verge meetup on a boat in Amsterdam. Our CEO presented our project and made a case for ICO’s at the Münster blockchain meetup. We were also one of the official ICO sponsors at the World blockchain summit in Frankfurt where André gave a speech about our project. We started sending out a weekly newsletter to keep our community informed. We developed a short demo as a proof of concept of our application to show off at conferences. We redesigned our website and whitepaper for a better user experience. We started an interview series so that our community could learn more about the members of our team. You can find the back catalogue for this series on our Steemit page. We also started our Did you know? series, breaking down each part of our whitepaper to provide a better understanding for our community. You can find the back catalogue for this series on our Medium page. We forged a very lucrative partnership with Limechain, the details of which are available in this article. The three founders of Carpooling, a platform which had seven million users and was acquired by BlaBlaCar, joined our advisory team. We kicked off our 21-week bounty campaign, offering up a total of 3 million MYO tokens to all participants. We completed the first stage of our private sale, raising a total of 580,000 euros. We also hosted the whyit expo at our headquarters in Münster. We hosted a community contest, a chance for our community to supply mock job posts for our application demo, netting a reward of 200 MYO tokens if successful. We built a partnership with DLT Capital. We attended the East-West Crypto conference in Frankfurt. Hosted an airdrop for our community. We had a booth at the Malta blockchain summit where we showcased our MVP and meet many fantastic people within the crypto community. We received an exclusive invite to the blockchain startup summit in Frankfurt where André gave another fantastic speech! Our project was assessed by ICObench, and they rated us 4.6 out of 5! We were also rated by ICOmarks who gave us a 9.1 out of 10! In short, 2018 has been absolutely amazing. We look forward to working with you to make 2019 a fantastic year! Simply getting the job done.